Flora Nwapa (full name: Florence Nwanzuruahu Nkiru Nwapa) was a female Nigerian writer, born in Oguata, Eastern Nigeria on the 13th of January 1931, and died on the 16th of October (Chinua Achebe's birthday) 1993. I wonder what she died of. She was actually of Chinua Achebe's generation. They both attended University of Ibadan, an appendix of London University then, it became a fully fledged Nigerian University after the Independence of Nigeria from the British in 1960. She later on travelled to England where she obtained a degree in Education from the University of Edinburgh. With her first novel Efuru published in 1966, which I am yet to read, she was proclaimed the first female African writer to publish in English. She is also credited with being the first African woman to establish two publishing houses, one specialised in Adult Fiction and the other in Children's Fiction. If Chinua Achebe is widely known as the father of African Literature, Flora Nwapa is considered to be the mother, as well as a feminist. Although, the latter she denied. Nonetheless, she once said in an interview that her interests lies on the rural and urban women on their quest for survival in a fast changing world dominated by men. 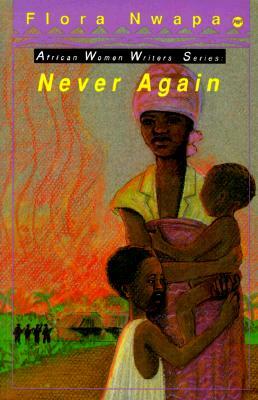 Never Again is what you could regard as a novella, it consists of eighty-five pages. Its brevity is no deterrent to peruse it. As a matter of fact, it is an engaging and a voracious read, and certainly not brief in content. The story was told in a first person singular, which I utterly enjoyed because I connected with the narrator at once. Kate, an upper middle class Nigerian Citizen, married, with five children, and her housemaid had to flee from one place to another in search of safety in 1967 when the Biafran War erupted. Their run off started from Enugu, Onitsha, Port Harcourt, Elele and at last Ugwuta their home town. In fact, they were in the throes of a conflict break out on account of post colonialism, however, Kate was determined to survive with all her household members. Did the war finally found them in their home town? In what condition? This novella tells the story of the war through the eyes of Kate. Do not expect a detailed description of the conflict, as I said earlier it is eighty-five pages novella. To put it differently, Never Again is an entertaining, heart-rending short novel, of which, I recommend to all and sundry. It is an easy read. Regrettably, I've not read any of Flora's books. Hey Nana, this is her first novel I have read so far. And I am looking forward to reading more. I will advise you to read her books as an African Literature promoter. She writes about women of wish I enjoy. Her style is easy. Hey Nana, this is her first novel I have read so far. And I am looking forward to reading more. I will advise you to read her books as an African Literature promoter. She writes about women of which I enjoy. Her style is easy. Wonderful review, Mary. I have never read any of Flora Nwapa's books, though I remember seeing a copy of 'Efuru' among my mother's chop-box of books. I will certainly put her on my wish list for the very near furutre. Hope all is well with you, my dear. Celestine, it amazes me how not so many African Literature bloggers have read Flora Nwapa's. I am of the opinion that she is one of the most important figures in African Literature, considering when she started and all her efforts. I hope to set my hand on "Efuru". I am also looking forward to read more of her books. I am fine dear. I hope you are coping well with the present situation. I have you in my thoughts. Thank you for stopping by. I have read Efuru, Idu whilst in junior secondary school in the late eighties. Fantastic writer Flora Nwapa is. Efuru is non-stop read. You will enjoy it. Sadly the reading culture is slowly going away especially amongst the children and youths. I hope to get a copy of her books so my kids can read and appreciate what foremost African novels is like. I have not yet read Efuru; however, from my experience with other Flora Nwapa's novels, which I thorougly enjoyed... I am certain that Efuru is a non-stop read. I am looking forward to reading it, since I have officially proclaimed myself her fan. I am of the opinion that the reading culture is gradually coming back to incorporate itself in our lives. And it is defnitely coming back to stay. Perhaps not as what it used to be before but, in an engaging different way. If you live in Europe or the USA, Canada.. etc you can easily get copies of almost all the African writers through Amazon. Good luck! Please, check out my author's link to view author's novels I have read. Hope it helps. Thanks for you to reply. However, the link you gave me doesn't have any on Idu but on other works by Flora Nwapa. Thank you. Just checked the link you sent, but apparently, there isn't a single work on Idu. Just on other works by Flora.